Medic, oh Medic, will you not save me? As I'm right next to a heart quite rotten? Medic, oh Medic, will he ever learn? Save Archimedes! Gib a Scout today! PS: Now you know why some Scouts constantly yell "MEDIC!" 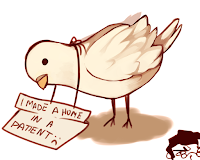 Bird shaming image from takedaa of tumblr.